I have some happy news to share. I have been selected to join the new design team for Paper Creator. I love their products. They have awesome precolored digital images from Sassy Cheryl, Diane Carubia of Di's Digi Stamps and many other wonderful artists. Lots of great kits with fun shaped cards and mega bundles too. Click HERE to check out the store. For an extra 20% discount off your order, please enter coupon code DELORIS. 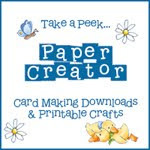 Hope you can join us for the new challenges starting next month at the Paper Creators BLOG. The Jan theme is Anything Goes. Woot woot Deloris how awesome.... I wish I had known about it, shucks!